#OURVISION We believe that Puerto Ricans can build a global model of community-driven success. Together, listening to each other, we can jointly solve any problem, jointly overcome every challenge, jointly build an equitable and resilient foundation for a better Puerto Rico. ConPRmetidos is not immune to the impact of last fall’s hurricanes and the forces demanding change in Puerto Rico. The events we lived through have changed us as well; for the better. We are committed to Puerto Rico and its people. We advocate for a collaborative culture in Puerto Rico where everyone plays a role in transforming the island’s socio-economic landscape. We believe in diversity of thought, experience and perspective. We believe inclusive solutions benefit society as a whole. Fearless and unconventional, we develop and champion fresh approaches that target root causes. Trust is our currency; we manage relationships, resources, and ourselves in an impartial, transparent, and efficient way. We are not perfect and don’t have all the answers, but our north is clear and our mission is set. We hope you will continue to walk with us and support our work. Please know that if you ever have a question or comment about ConPRmetidos, we can always be found at ideas@conprmetidos.org. Validated research and previous post-disaster experience confirms that gender violence spikes after catastrophes. After the 1989 Loma Prieta (CA) earthquake and after hurricane Katrina, reports of sexual violence increased 300%. Puerto Rico is not an exception to this, with the main centers for support and assistance to women reporting increases of domestic violence since hurricane Maria made landfall in September 2017. Furthermore, with the power grid knocked offline, emergency lines to report abuse were also offline, representing an unprecedented safety issue for many adults and children trying to escape domestic violence and intimate partner violence of all forms. 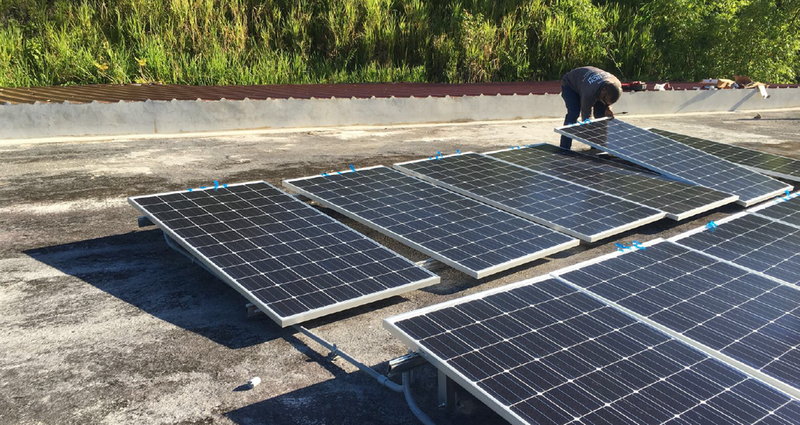 With this unfortunate reality in mind, and enabled by your donations, ConPRmetidos installed a 5kW solar energy system at a women’s shelter in the municipality of Arecibo (see photo below). According to statistics published by the Puerto Rico Police Department, Arecibo reported the second highest rate of domestic violence incidents in 2017. Solar panels being installed in Arecibo women's shelter, April 2018. As you may recall, ConPRmetidos recently led a delegation of over 30 Puerto Rican leaders to New Orleans, to learn about that city’s remarkable transformation following hurricane Katrina in 2005, and to establish strategic alliances with many of the organizations and civic leaders responsible for that rebirth. A key message they all shared with the traveling delegation was the absolute need for increased collaboration across different sectors, to share best practices and novel ideas, to challenge convention and inspire unexpected opportunities. In March, we organized a special forum on the anniversary of hurricane Maria. The Six Months After Maria Forum, hosted by Foundation for Puerto Rico, a leader in advocating for socio-economic development on the island, the event included a panel discussion on post-Katrina recovery lessons with Andy W. Kopplin, President of the Greater New Orleans Foundation, and Robin Barnes, Vice President of GNO, Inc. In April, New Orleans entrepreneur and CEO of Turbosquid, Matt Wisdom, gave a community talk on Resilience in Entrepreneurship (see video below). The event hosted in partnership with startup accelerator, Parallel 18, was itself an example of what it was advocating: public and private sectors must come together into alliances to support community-driven and entrepreneurial socio-economic development. And this first week of May, as part of Fundación Banco Popular's Big Ideas Challenge (in partnership with the Hispanic Federation) to incentivize different thinking and the reimagining of solutions to the island’s most pressing needs, Daniela Rivero Bryant, the former Executive Director of Rebuilding Together New Orleans, shared lessons learned post-Katrina on how improving the quality of life of those in need through home repair and community revitalization projects can have long-serving, positive repercussions. Stay up to date! We send monthly newsletters with updates on the programs we are empowering and regularly report on investments made, so donors and supporters can have visibility into ConPRmetidos' responsible stewardship of funds raised towards Puerto Rico's renewal. Puerto Rico will rebuild smarter, and will be stronger and more resilient than ever before. That is our promise to our supporters and donors, and is an unbreakable commitment to the people of Puerto Rico. To learn more about ways you can help ConPRmetidos, please click on the button below or visit: www.conprmetidos.org ¡Gracias!